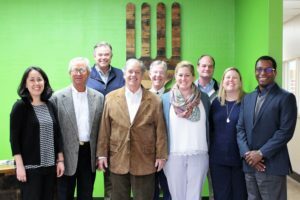 In 1981 a small group of committed volunteers worked side by side the United Way of Central Alabama and the Greater Birmingham Foundation to open the Community Food Bank’s doors. In our early years, we focused solely on feeding neighbors in need of emergency food. 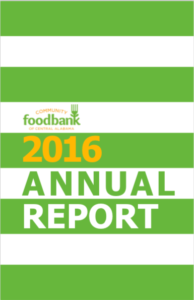 In 2016, our Board of Directors took the bold step to broaden our mission and also address hunger’s root causes. Now we take a two-pronged approach to solving hunger. We feed people in need today and foster collaborative solutions to end hunger tomorrow. Together we’re feeding over 60,000 people at risk of hunger per month. We accomplish this mission by supplying millions of meals per year to over 230 food pantries, shelters and children’s programs in 12 counties in Central Alabama. Our aim is to ensure people in need can access emergency food near where they live. When we identify a gap in this network that leaves specific populations vulnerable to hunger, we operate direct meal programs. For example, we provide fresh produce and groceries to seniors, children at risk of hunger during school breaks, patients facing chronic illness, first-time mothers and others in need. For easy access, we deliver to key locations like schools, senior housing facilities, medical clinics and more. The Community Food Bank also incubates social enterprises that promote nutrition, prevents wholesome food from going to waste and tests new initiatives that go beyond charity to create healthy food access for all. Blount, Calhoun, Cherokee, Clay, Cleburne, Etowah, Jefferson, Shelby, St. Clair, Talladega, Walker, and Winston. Kathryn is Executive Director of the Community Food Bank of Central Alabama. She also chairs the Alabama Food Bank Association and the Bold Goals Coalition’s Healthy Lifestyles Priority Group. Previously, she served as director of multiple nonprofits including the Food Bank of North Alabama, LIFT Housing and the Community Mediation Center. Strickland holds an M.A. from the Illinois School of Professional Psychology and a B.A. from Davidson College. In 2015 she was awarded the Alabama Association of Nonprofits’ annual scholarship to the Nonprofit Management Program at Harvard Business School. While living in Bozeman, MT, she led hiking & cycling trips in locales including Yellowstone, the Tetons, Mongolia, Tahiti and Botswana. She is a big fan of veggies and views farmers as her heroes. Adrian Anderson has been a SNAP Outreach Coordinator of Central Alabama since June 2014. Over her tenure, she has assisted with the growth and sustainable expansion of the SNAP Outreach program throughout the Central and North Alabama regions. She holds a Bachelor of Science degree in Humans Service and a Master of Science degree in Social Work. She has participated in seminars and conferences on both the local and national level, advocated for SNAP preservation and expansion, and continually works with community and agency partners to enroll and educate our neighbors in need about benefits that may help them end their cycle of hunger. David Appleby joined the CFB team in 2019 as our Food Donor Coordinator and manages the Community Food Bank’s grocery store donation program and fleet maintenance. He assists our partner agencies and food donors that rescue consumable foods left behind by grocery stores. Before starting a career in food banking, David started his own business in Ebook consulting, writing, and publishing. He received his Bachelor of Arts degree in Anthropology from the University of Alabama and a Bachelor of Science in Management from UAB. Jon Barnacastle is Programs Coordinator at Community Food Bank. On staff since November 2013, Jon oversees several of the Food Bank’s direct service programs including the Kids Meal Campaign—Weekenders Backpack, Family Market (or “school pantry”), and Summer Meals. Having served in multiple Feeding America capacity-building committees, he is well-versed in best practices shared by food banks across the country in expanding service to vulnerable populations. Andrea Brown is the Business Manager at the Food Bank. Since joining the crew in 2008, Andrea keeps this ship afloat. Andrea managers accounting, billing, and employee benefits. She also oversees grant funding and donor relations. Her hobbies include antiquing, gardening, and DIY projects on her historical home. Shalitha McLean joined the Food Bank team in July 2017 as the Partner Relations Assistant, but is now our Volunteer Coordinator. She has experience in management and community engagement along with a B.S. in Public Health from University of Alabama at Birmingham. Throughout undergraduate Shalitha enjoyed volunteering and exploring the great Magic City. Along the way, she developed a passion for helping those in our community. She is currently pursuing her Master’s in Public Health at UAB with a focus on health behavior, so that she can expand her knowledge and further her career serving those in need. Jamie McLynn is our Special Projects Coordinator. Jamie graduated from the University of Georgia (Go Dawgs!) with an ABJ in Advertising and BS in Sociology. Her involvement with Dance Marathon and Children’s Miracle Network Hospitals while in college sparked a love of nonprofit work that continues to this day. Prior to CFBCA, Jamie lived in Connecticut and served on the programming team of a nonprofit camp for seriously ill children and their families. Four years at camp developed her into an expert slime-maker, party-planner, and prank-player. Jamie is a member of the Young Nonprofit Professionals Network, is a Certified Nonprofit Professional, and is working on her graduate certificate in Nonprofit Organizations. When she’s not tending to her very special projects at the Food Bank, Jamie loves to explore Birmingham and hike with her husband. She thinks “y’all” is the best word in the English language, and is very happy to once again live in a place where it’s part of the vernacular. Nicole Standridge is our Agency Relations Manager. She recruits, on-boards, and trains our Agency Partners in reporting, food safety, and shares best practices throughout our network. Nicole joined the Food Bank in 2017, and has adopted an adorable terrier mix named Stevie. She is currently working toward her Masters in Public Health and a Masters in Public Administration. Elizabeth Wix is the Director of Partnerships at CFB. She first joined the team in spring 2017, working in Agency Relations. She now handles CFB’s development including external relations, community outreach, social media, communications, marketing, fundraising, and donor recruitment. Elizabeth earned her BA and MA in Anthropology from the University of Alabama (Roll Tide!) and continues her education through numerous workshops, webinars, and nonprofit development course work. She currently serves on the American Heart Association’s Health Equity Committee for hunger relief efforts in Fairfield. A native of Muscle Shoals, Elizabeth has lived in the Birmingham area since 2012. After several years of working in the corporate world, she decided to seek purposeful work in the nonprofit sector. She enjoys road trips with her husband, live music, flowers, and most of all her two giant hound dogs, Ladybird and Jolene. 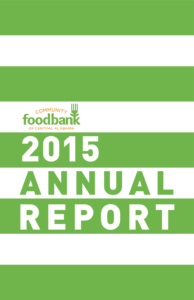 Anything and everything you want to know about the Food Bank! Are you passionate about ending hunger in our community? Want to work for the Food Bank? Check out our available positions here.